We always fail to insert videos into PowerPoint presentations if the vidoes’ format is not supported by PowerPoint. The common supported video formats for PowerPoint on Windows are MPG, AVI, WMV, or ASF, and more compatible video format for PowerPoint on Mac are MP4 and MOV. You might be frustrated when you try to insert other video formats like VOB into PowerPoint. How to easily playback a video that is VOB format when inserting it into a PowerPoint presentation? Good expericence proves that converting VOB format video to a PowerPoint compatible format is the best solution. How to Convert VOB to PowerPoint Compatible Format? 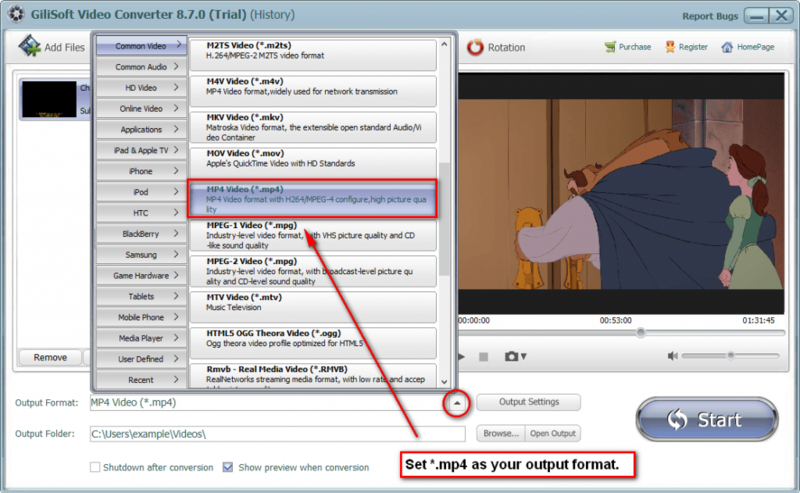 This post is aim to introduce a step by step guide on how to convert VOB to PowerPoint compatible video format like MPG. This guide is also applicable to convert other video formats like FLV, MKV, RMVB, MXF, AVCHD, Apple ProRes, MP4, MOV, TS, 3GP and etc to PowerPoint video format. Free download the powerful VOB to PowerPoint Converter – Gilisoft Video Converter (for Windows), install and run it, the following interface will show up. Gilisoft Video Converter is fairly easy to use. Besides converting VOB to PowerPoint video format, it also supports converting PowerPoint incompatible video formats like 3GP, FLV, F4V, OGV, WebM, WTV, DVR, MVI, MOD, TOD, MKV, TS, AVCHD, RMVB, MP4, MOV, DV and etc to PowerPoint supported format. Click on “Add File” button to import the VOB video file which you need to convert. 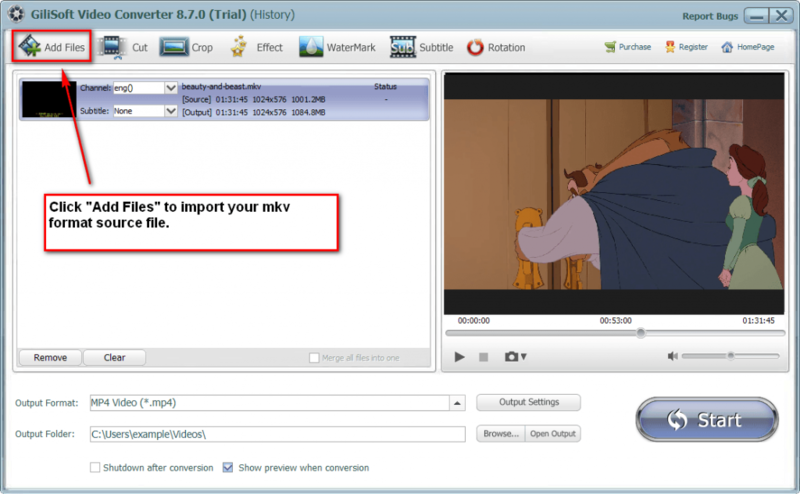 You can also simply drag and drop a source file into the main window of Video Converter to complete file importing. Click the small triangle to the right of Profile, a drop down menu for media format will pop up, select the preferable PowerPoint video format like MPG, AVI, WMV, ASF, MP4 or MOV from the “General Video” category. Tips: To insert VOB in PowerPoint Windows version, MPEG-1 Video (*.mpg) is recommended. Before converting, you can edit the unsatisfied video by clicking the buttons on the top of the interface such as video playing effect (brightness, constract, saturation), video length and dimension. After finishing converting VOB to PowerPoint video format, simply insert the converted VOB files in PowerPoint for playing VOB in PowerPoint. Tips: make sure the converted VOB files and the PowerPoint in the same directory. In order to insert vob files into powerpoint, it is better to use a third party software like Gilisoft VideoGo to convert vob to powerpoint more supported MPEG-1, AVI, WMV etc. I recommend Gilisoft Video Converter which can to convert the unsupported AVI to PowerPoint supported video format with the supported codec.